Steven Donziger has fought for a decade to take Chevron for $10 billion, and all he has are extortion charges to show for it. Steven Donziger is the face of an international effort to collect nearly $10 billion from oil giant Chevron. Over 20 years, his efforts have consumed, and very nearly wrecked, his entire life. He's been sued, harassed, vilified in the media, and flatly accused of overt corruption. He even alleges he's been followed by ex-spooks. Worst of all, he may have sacrificed his morals in the process. In the first part of the Lago Agrio oil fields case, VICE looked into how Donziger and his team are using the Canadian courts to force Chevron to pay their bill. But any story about one of the world's most fiercely fought lawsuits can't be told without looking at who is arguably the central character. Donziger stands six foot four, but his huge frame makes him look even bigger. He's a former public defender who has, since his university days, implanted himself in the fight to have Chevron clean up one of the world's most extreme environmental contaminations. To ask the environmentalists, Donziger is a holy crusader, fighting to get justice for those who destroyed a delicate ecosystem and endangered thousands of lives. To ask Chevron, Donziger is a morally bankrupt huckster who has no problem bribing judges and falsifying evidence in his deranged campaign to make Chevron pay. "Donziger believes he can outsmart the American court system, subvert it, manipulate it, intimidate it, and shout it down," wrote Fortune senior editor Roger Parloff, in begging the US government to file criminal action against Donziger. Rolling Stone, on the other hand, lauded him as a "workhorse" and champion for the down and out. "Staying in the ring against Chevron for two decades has required more than simple stamina," Alexander Zaitchik wrote. "It has demanded of Donziger a fierce slow-burn resolve he has wielded in ingenious and self-defeating ways." Meeting Donziger, it's immediately clear that both versions can be true. Face-to-face—or, for most people, face-to-chin—Donziger exudes the sort of zealotry that is equal parts altruistic do-gooder and all-consuming need to win. That is to say, the New York lawyer seems to care as much about winning this case for the Ecuadorians whose homes and environment have been destroyed as he does about beating Chevron. It's tough to blame him. Chevron's game plan in the Lago Agrio case has been to aggressively pursue its claims—sometimes at the expense of Donziger. Donziger first went to Ecuador in 1993, brought by a university friend to witness the devastation caused by a joint oil exploration project between the government and Texaco. "There was oil all over the road and people were walking barefoot with oil on their feet and bodies," Donziger told VICE. "There were fires burning in a lot of the pits because the company would deliberately set them on fire as a way to burn off their contents, which would cause terrible air pollution." He described it as "apocalyptic." Donziger went back to Harvard—where he was playing basketball with Barack Obama—and finished his degree. A decade later, in 2003, he became the face of the lawsuit. In 2011, they won: an Ecuadorian court sided with the plaintiffs, ordering Chevron, which had acquired Texaco, to pay $17 billion to the villagers affected by the development. Thanks to that win, Chevron has made Donziger himself a major focus of its strategy in the ongoing case. In his personal life, in the media, and in the courtroom, Chevron has gone after Donziger at least as hard as he's gone after them. In a briefing with VICE, Chevron maintained two things: that it's the Ecuadorian government's responsibility for both the environmental degradation and the cleanup, and the sites Texaco cleaned up when they left Ecuador in 1993 remain safe. Arguments to the contrary, they say, are just a product of Donziger's take-no-prisoners approach to the lawsuit. Infographic produced by Chevron as part of a PR campaign against the Ecuadorian lawsuit. Chevron has long argued two things: that it's the Ecuadorian government's responsibility for both the environmental degradation and the cleanup, and the sites Texaco cleaned up when it left Ecuador in 1993 remain safe. Donziger, naturally, contests both points. Fighting in an Ecuadorian courtroom, he laid out a mountain of evidence and expert testimony that contradicted the company's line. Locals, like indigenous leader Humberto Piaguaje, have attested to the damage. "For five decades, we have been affected by Chevron's contamination," he said in a statement provided to VICE. "We suffer today." In the courts, Donziger's experts presented evidence that the areas Texaco supposedly cleaned up were, in fact, still heavily contaminated. So Chevron went after the experts. The company produced proof that Donziger and his team hired a consulting firm to ghostwrite those experts' reports, using the scientists as trojan horses for junk science. Donziger and his team says they did nothing wrong, and that, while they did write up some of the expert testimony, they never changed the experts' findings. The problem is, several of Donziger's experts came forward to disavow his case and claim their research was fabricated or contorted. The environmental consulting firm hired by Donziger stated publicly that it was "not aware of any scientific evidence that people in the former concession area are drinking water contaminated with petroleum." That admission was not exactly voluntary. Months earlier, the same firm swore that "contamination was present at every single well site and station that was sampled." Stratus' reversal came after Chevron came after them with a hefty lawsuit. That lawsuit was later dropped. It's a common theme in the case. Donziger presents evidence of contamination, often obtained through murky circumstances, and Chevron sends its legal team to destroy it. A prime example is Alberto Guerra, a former Ecuadorian judge and the linchpin of Chevron's allegations against Donziger. He claims, in a sworn affidavit, that he had an ongoing arrangement to ghostwrite trial judge Nicolás Zambrano's rulings. Zambrano presided over the Chevron case and delivered the $17-billion pro-plaintiff 2011 ruling. In his sworn affidavit, Guerra also claimed that the plaintiff attorneys, including Donziger, paid both himself and Zambrano to deliver the favorable ruling. Along with the testimony of the experts who turned on Donziger, it makes his case look outright fraudulent. Guerra isn't exactly a credible witness, though. He was presiding over an earlier leg of the Lago Agrio case before he was removed from the bench for an unrelated corruption case. He was also, in Donziger's words, "nearly destitute and desperate to join his son and daughter living in the United States." Chevron stepped in to help out— they paid Guerra $38,000 and got him and his family into America. They also kicked in health insurance, a car, and other perks. Donziger's team says the cash and benefits top out at over $2 million. Chevron's people say Guerra's life was in danger, and they were merely helping out. The spiralling list of allegations read like the plot of a John Grisham novel and has become a constant back-and-forth of accusations. Donziger says Chevron buried evidence that the drill sites were dangerously contaminated. Chevron says they have video evidence of Donziger laying out his scheme to corrupt the Ecuadorian judicial system. Donziger says Chevron set up a sting operation to try and entrap an Ecuadorian judge into taking a bribe, which failed, just to have him thrown off the case. Chevron's take-no-prisoners tactics in the courtroom highlight just how much the company cares about winning this case. The company rolled all these allegations against Donziger into one of the most extraordinary lawsuits in American history. Chevron lawyers brought him up on racketeering charges. The Racketeer Influenced and Corrupt Organizations (RICO) Act has been instrumental in jailing corrupt politicians and mafia families for decades. It's primarily criminal legislation. 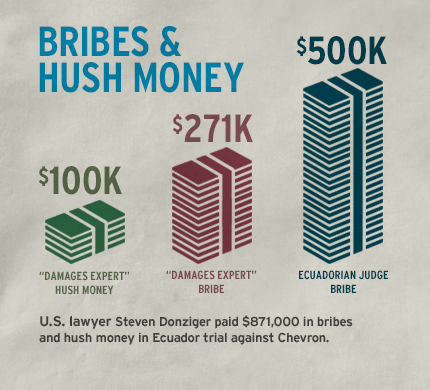 But some clever lawyers on Chevron's team had the novel idea of using civil court to bring charges against Donziger for colluding with the Ecuadorian courts in a campaign of bribery, intimidation, and forgery to extort Chevron. Surprisingly, Chevron won. New York Judge Lewis Kaplan found that Donziger had indeed run an unscrupulous campaign against Chevron. A Chevron-produced video about the racketeering case against Donziger. Donziger is appealing the decision, and both he and the lawyers who represented him during the case have argued that Kaplan was outright biased in favour of Chevron. Judge Kaplan did take some extraordinary steps. He had Donziger's hard drives and personal journal entered into evidence. It was an extraordinary breach of attorney-client privilege that nevertheless uncovered clandestine meetings between Donziger's team and the supposedly corrupt officials, as well as secret bank accounts used to pay experts. However, even this evidence is mostly circumstantial and doesn't prove outright fraud—unless you consider Guerra's testimony. The judge also ordered 600 hours of raw video footage entered into evidence. The footage supposedly proves Donziger's malicious intent. Donziger says the footage has been edited to look nefarious. But to get it, Kaplan ordered the footage be seized from a documentary filmmaker who had profiled the Lago Agrio story. Many, including Robert Redford, called it an assault on the freedom of the press. Putting aside all the fighting over the initial 2011 decision, Donziger raises a compelling counterpoint: the initial judgment he supposedly bought with bribes was upheld by an Ecuadorian court of appeal and the country's supreme court. There's no evidence that there was impropriety in the two subsequent court cases, which re-evaluated all the evidence. Even if Donziger wins his RICO appeal, it will be years before he's allowed to pursue the case in America again. As the fight gets nastier, it's just a matter of who cracks first. "Our [long-term] strategy is to demonize Donziger," reads an internal Chevron email posted on Donziger's personal website. And they're very good at it. The company runs a newspaper-like Amazon Post dedicated to countering bad press about the lawsuit, a litany of social media accounts in multiple languages, and a series of slickly produced YouTube videos to make its case. "They believed they could take Chevron's reputation hostage and ransom it back to the company," says Chevron's ominous narrator as a gavel bangs in the background. "They were wrong." On the other side, a team of environmental NGOs have launched their own bombastic PR campaigns, somewhat in conjunction with Donziger's team, aimed at profiling Chevron and its "human rights hitmen." A cartoon produced by ChevronToxico, which was set up by one of the NGOs supporting Donziger. Chevron has the resources at its fingertips to prolong the fight against Donziger. He reckons that Chevron has dropped around $2 billion on this case since the early 1990s between lawyers, PR firms, and private investigators. "A central component of their PR strategy is to demonize the lawyers and, given my role in the case, I have become the primary target for the team," Donziger said. Donziger says the company has even employed ex-CIA and FBI agents to tail him. "They have physically followed me around Manhattan and Ecuador. They have videotaped my comings and goings in Ecuador while I was there," he says. That might sound crazy, but it's not. Journalist Mary Cuddehe wrote in the Atlantic that she was approached by Kroll, a massive international corporate investigation firm, to do espionage on Donziger and his team in Ecuador. She said no, but Kroll almost certainly found someone else. Chevron's roughly $15-million contract with Kroll can undoubtedly net some good spies. Donziger's side isn't exactly a mom-and-pop operation, however. He's had his resource-intensive lawsuit bankrolled by venture-minded law firms, investment funds and wealthy benefactors. They're all in it for a cut of the eventual judgement. Chevron has been trying to put the kibosh on that. In September, lawyers filed lawsuits against three of Donziger's backers in Gibraltar. Subsequently, several of the law firms and companies helping with Donziger's case have backed out due to his lack of funds. Others have fled because of the bad press. Still others have flat-out gone after Donziger, saying they were misled and tricked. What's clear from the whole mess is that no one—save, perhaps, the Ecuadorian villagers who've had their territory devastated—can claim a clear conscience.